The last day of term saw us say a sad but fond farewell to our year 6 pupils who are heading off to HCC in September. The children all read their thoughts and memories about their time in school and Reverned Kathy presented the leavers with bibles to help them on their journey. During the last week of term pupils from Black Torrington school and Bridgerule school joined together for a day of beach activities at Widemouth Bay. The older children enjoyed surfing off Black rock, whilst younger members built sand castles, took part in races and enjoyed a paddle in the sea. The day was great fun, lots of tired but happy children on the bus home. The whole school visited the National Marine Aquarium in Plymouth. They had a fantastic time, our guide was Stu who kept the children captivated, explaining the different areas of the site. Class 2 took part in a workshop where they learned about how much salt is needed in water to make things float, then they learned about the different ways sea creatures feed themselves. Class 1 enjoyed some role play, and looking at the sting-rays in the curved tank. Years 5 and 6 children from all four of the federated primary schools went on their annual residential trip with their teachers. This year they stayed at a PGL centre- Barton Hall in Torquay. They had a fantastic time, enjoying lovely weather and learning lots of new skills including- mountain-biking, aeroball, orienteering, crate building and archery. 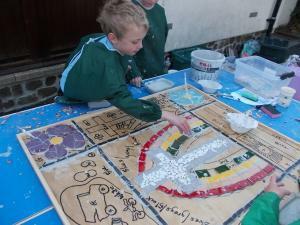 The children all had a great time and reports from parents have supported this. Thanks go to John Nettles for his kind donation towards the cost of the trip. This week Yrs 5 and 6 joined with their peers from Bradford and Bridgerule Schools to attend the annual Junior Life Skills event at Barnstaple Football Club. Whilst there, they found out about electrical safety and also what to do if there is a chip pan fire in the home. Pupils also wore 'beer goggles' so that they could experience what it might be like to be under the influence of alcohol, they had to cross a model road, and found it hard to judge where the pavement was. Another key skill that was taught was how to administer emergency first aid, but to understand the need to keep yourself safe as well. The children really enjoyed this event and talked avidly about it during our celebration assembly. On Thursday 14th May, the children who attend WOW club led the school's collective worship, as they had been finding out about Ascension, the day before at club. They talked about Jesus ascending to heaven, and what he had told the disciples to do before He left them. The KS1 children had made a scene in heaven, and the KS2 children had produced flip books to show Jesus' ascent. Here are members of the club acting out the story of Doubting Thomas. We have designed a mosaic. The images we chose represent the family feel of our school and include, love, sunshine, toys and friends.